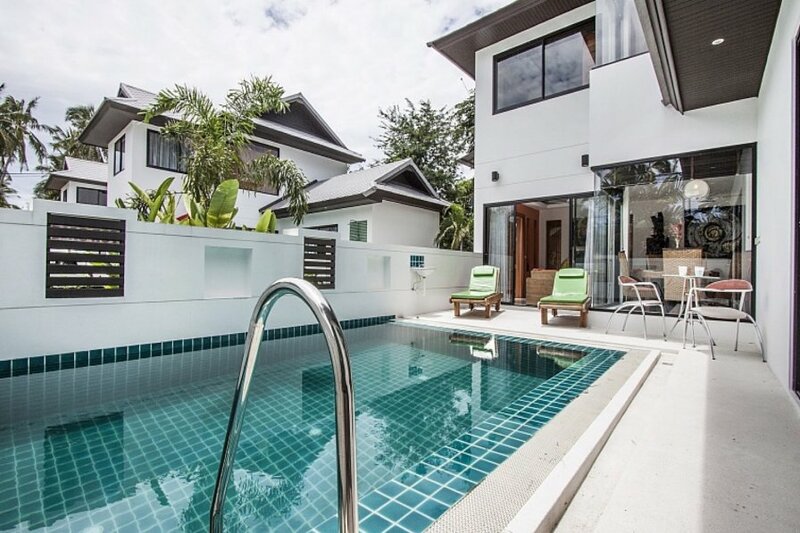 The two-story Banthai Villa 11 is placed just a short distance from the main road (100 meters) but boasts absolute serenity and stillness throughout for guests to enjoy a relaxing retreat with no disturbance whatsoever. Enter the property through a secure front door and soak up the flawless, modern interior with a soothing white colour scheme contrasted with Thai decor and polished wooden furniture. Downstairs hosts the main living area, kitchen and master bedroom, all of which overlook the calming waters of the private swimming pool. Climb the staircase and enjoy the surrounding views at the top where you can find the additional two double bedrooms both equipped with their own spacious wardrobes and ornate furniture from Chiang Mai. The 3 bedrooms are for 6 guests. The villa is brand new so is fitted with a number of top quality features including a generously sized television with 250 channels, an excellent WiFi service as well as a washing machine and the luxury of air-conditioning.